Apollo has painted over 100 wall murals, frescoes and tyrollian work for commercial and residential customers. Apollo is available for Commissions on a Worldwide basis. 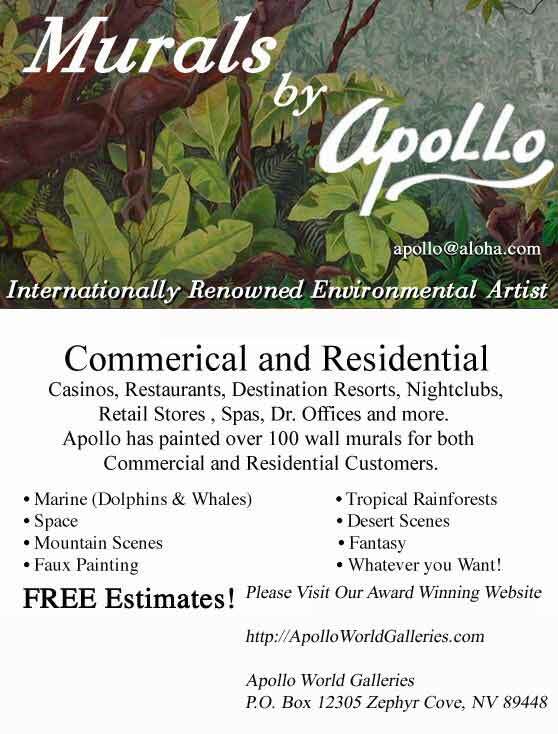 Apollo has painted Murals for Restaurants, Nightclubs, Ski Resorts, Video Stores, Electronics Stores , Casinos, and Destination Resorts, in such places as Las Vegas, Nv._Reno Nv._Carson City, Nv._Southern and Northern California._ Maui and Oahu. Marine, Tropical Rain forests, Space, Deserts, Mountain scenes, even Disney style Cartoons.............Apollo can meet and exceed any challenge no job or project is too big. requirements of each specific project. Over 60 Beautiful Wall Murals From Apollo's Art are Now Available from "Murals Your Way"
in a Variety of Sizes!! Apollo's collectors are World wide.